March 2015 - Notes from D.J. Lynn Patterson (right) died suddenly and unexpectedly Tuesday night. He and his family run Red Acre Farm CSA in Cedar City, and we have worked closely with all of them over the years. Lynn was an amazing man, always helping someone – sometimes us. Later, when I got home, my concerns shifted from the family to (as they too often do) myself. Lynn was three years older than I am. He never drank, smoked, or drank coffee He was thin and active, and ate an astoundingly healthy diet. I can’t claim any of those attributes. Recognizing my own mortality caused me to reflect on what I’m doing with my life. What am I contributing? Who am I helping? Have I cleaned up my messes? Who am I serving with my life? The answers were unsatisfactory. I’m an accountant, helping people to “render unto Caesar.” No matter how you slice it, I help the government collect what people owe them. Yes, often I am able to get someone a nice refund – but only in the context of the tax law, the purpose of which is to fund the government and its corporate buddies. And no, I have not yet cleaned up all my messes. What do I do with this new awareness? I’m committed to tax work until April 15. But today, I helped the Pattersons find their son, whose location has been unknown. (He doesn’t know yet about his father.) I made an amends that has been lingering for several years. And I practiced playing “Amazing Grace” on the piano – not for the Pattersons, whose daughter plays piano better than I am ever likely to, but for myself, and if it’s not too corny, for God. It is said that a person cannot serve two masters. So long as I serve the government, I am not serving God. But I have expressed my intention to find a “new employer,” and I believe that will work itself out over the next few months. In the mean time, what can I do to serve God today? Starting today, the Kindle edition of Domino Theory is on sale for 99 cents! When I was young, I attended my family’s Protestant church. I went to Sunday school for eight years. I learned the biblical stories of Adam and Eve, Noah, Abraham, and Jesus. My teachers were, without exception, kind and thoughtful men and women. They encouraged me to think of others, and to give of my time, energy, and money to help those in need. As I became a teenager, I found that what I had learned at church offered little guidance. I struggled with issues of self-identity and the acceptance of my peers. I made a number of bad decisions, and entered a dark period of my life that lasted ten years. When I began to resurface, I was taught to seek out God. At the time, I knew nothing of God. The lessons of my church seemed to make little sense to a young man living in a complex world. My search for answers took me from a Buddhist temple in Los Angeles to a Catholic church in Thailand. My quest led me to obtain a degree in Theological Studies. But even an intellectual understanding of the Bible was not enough to bring me peace. I began to read the Bible with one question in mind: “What does this book mean for those of us living in the 21st century?” Finally, the answer began to be revealed. I don’t believe the Bible can be understood without asking ourselves, “Who was this written for, and what was it intended to say to them?” A passage written for a farmer in 1,200 BC, or an exiled professional in 600 BC, or an impoverished and outcast Christian Jew in 75 AD, projects a message tuned to their time and circumstances. 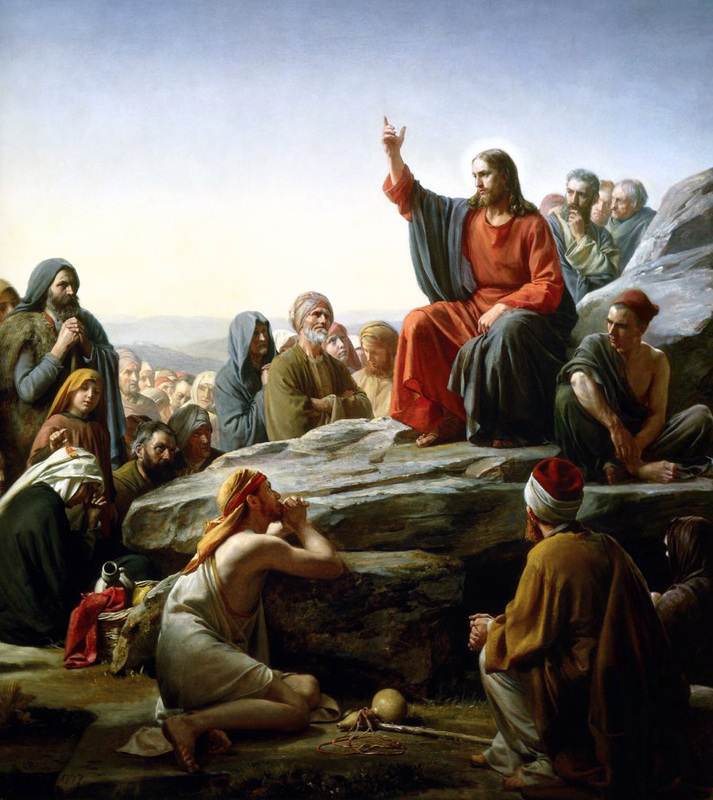 It’s not surprising, for example, that Matthew, who wrote to the Jews, has Jesus preaching the Beatitudes on the mountain, invoking the image of Moses. Luke, on the other hand, who was writing to the Greeks, has Jesus preaching the same sermon on the plain, invoking the image of equality. Both were trying to communicate the same Gospel message to a particular audience. Both chose imagery that would move that audience closer to faith. But the Jews and the Greeks had different frames of reference, so the authors used different imagery. Had Matthew written for us in the 21st century, instead of the Sermon on the Mount we might well be reading the Sermon at Bunker Hill! If I want to understand the Bible, I must ask myself what it meant to the men and women who wrote it, and what they were telling their audience in its time and situation. Trying to take literally words written for shepherds of 3,000 years ago can lead to absurd results. But the message intended for those shepherds is meant equally for us. To find it, I need to look beyond the wording to the ideas and principles of that message. In recent years, I have been struck by the increasing anger as people discuss the Bible’s role in our society. Some suggest that it must be taken literally, and should be adopted as a legal foundation. Others suggest it is outdated, fictional, and has no role at all in modern life. Both views are extreme. I prefer a more middle path, based on what we know about the Bible, and a little common sense. If what I have written offends you, I apologize. My most sincere hope is that this book will bring new understanding to those who, like me, have struggled with what the Bible says and how it can work in our lives. I don’t know why people would read a blog from their phone. Their eyes must be better then mine! Nevertheless, Google wants all sites to be mobile-friendly, and what Google wants, Google gets. So, as of today, my blog is mobile-friendly. It’s been a long nine months, so long that I forgot my blog’s username and password, and returned to find 287 spam comments waiting for approval. But it’s good to be back. After weeks of it not getting better, my doctor put me on Singulair. But Singulair interacts with a triglyceride medication I was taking. I didn’t know that. Neither did my doctor or pharmacist. The interaction is listed on the FDA website, but apparently not in any of the databases used by health care professionals. Within two weeks, I had sunk into a suicidal depression and had to be hospitalized. The hospital prescribed Zoloft, an anti-depressant. I let them know I’d had a bad reaction to antidepressants once before, many years ago. The shrink insisted that this one was different. It wasn’t that different. Soon, I was having a full-blown psychotic reaction to the Zoloft. Eventually, I went back to a different hospital. There, they gave me other medications that had me not only psychotic, but also aggressive. Psych meds and I do not get along. From there, I was able to spend 30 days medication-free in a rehab in Culver City, CA. My brain finally started to heal. I am forever grateful for that opportunity, because I think psychiatrists would have either killed me, or left me in a straight jacket in a dark room for the rest of my life. For whatever reason, they don’t have an answer for me. I am prone to depression, and I’ve learned that I have to manage it with lifestyle changes. To be honest, I hadn’t been doing that. So perhaps the medication interaction only accelerated changes that I would have had to make anyway. In any case, it’s been a rough road, and I’m glad to be back.